This model an externally piloted counter balance valve. The model consists of an externally piloted pressure relief valve with a check valve in parallel. The ports of the model are connected to parasitic volumes. The Counterbalance valve is applied as a brake valve to get a positive control on a hydraulic cylinder or motor with a negative load. The check valve is used to get a free running actuator in one direction and the pressure relief valve is used to control the actuator in the other direction. 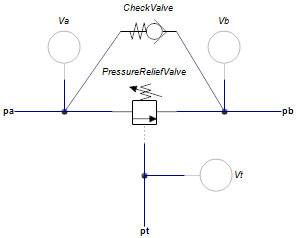 The relief valve is controlled by the external pilot pressure.